I first encountered one of Tatyana Murray's works in a house of a mutual friend in fall last year. 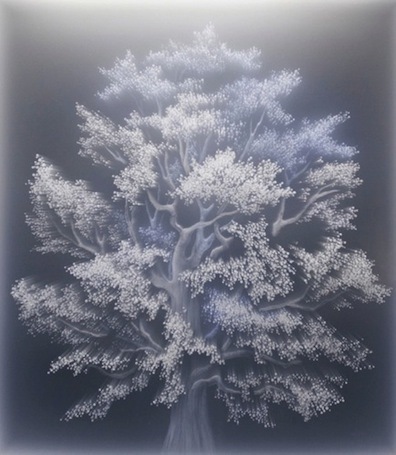 It was a luminescent ghost tree beautifully etched and suspended between layers of glass. As I moved closer the LED light switched off and the image hauntingly disappeared. I decided I had to track down Murray and pay her and her DUMBO studio a visit. But each time we spoke she would mention her new series -- with such a featherlite hop, skip and jump in her voice that her excitement was almost contagious -- and add that she was still working on it, and would give me the signal of when to come. For several months I waited patiently. Tatyana Murray, 39, cuts a strikingly tall, svelte figure. A free spirit who will resist being pinned down or controlled whatever the cost, Murray is what I call a true right-brainer: Her interactions with the world are wholly intuitive, instinctive and sensuous. It is exactly this kind of emotive spirit that Murray injects into her art. Not long after Murray disembarked in New York back in '95, she cast her eyes to the heavens and was instantly enthralled by the light. She dove straight into work, experimenting with light and various media, which culminated in her producing a series of etchings using layers of glass and advanced LED lighting. Her animal skulls, plants and sea creatures look like luminous relics discovered in the dead of night. 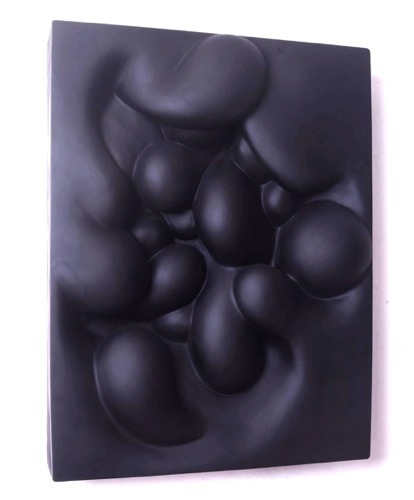 She also made sensual abstract sculptures made of hydrocal plaster and wood, evocative of fertility, the female body and embryonic life. Murray's new body of work, Dystopia, marks the artist's darkest most soul-bearing work to date. "It's funny... for the past year or two I've actually felt more secure and peaceful than ever... and this is when all this dark and powerful art pours forth." It's as though this newfound inner peace and strength enabled a large memory store of emotion to be unleashed. 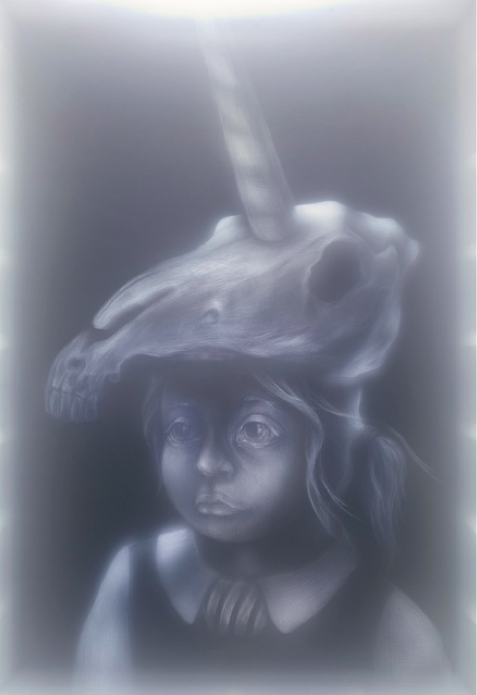 Using her prized LED lights, glass and drawing technique, Murray has created ghostly depictions of young girls in school uniform shrouded in darkness, either performing an archaic ritual or being mysteriously transported to some fantastical realm. The work is a powerful expression of poignant, dare I say, traumatic, memories from her childhood. At the tender age of eight, Murray was sent to a series of boarding schools (she hated each one of them) deep in the English countryside. The heavy authoritarian thumb, the forced cohesion, the whole thing, became her nightmare. Murray felt increasingly alone. The terror and the awe-filled excitement of running away into the forest and climbing and hiding in trees are etched indelibly on her mind. She found solace and "made sense of the world' in fantasy and fairy tales -- and, ultimately, in the world of art. 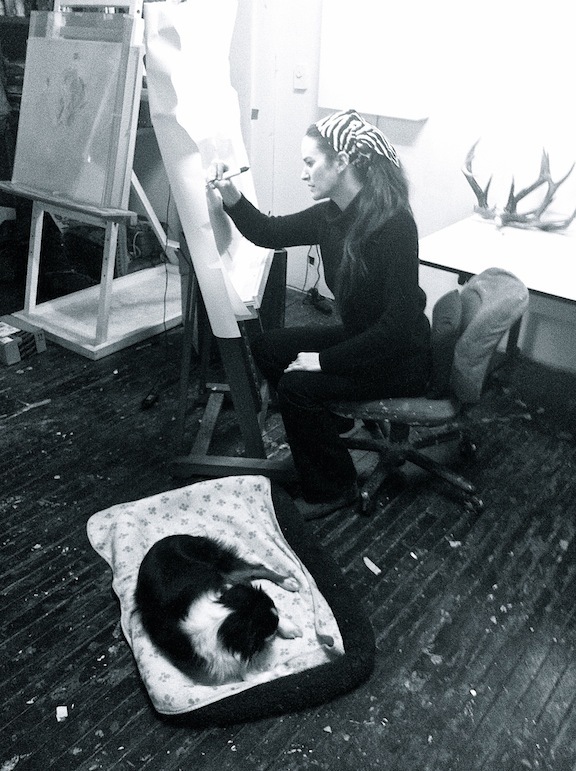 "The art studio was my haven. Whilst all the other kids were hanging out at the shops, I would plug myself into my Walkman and spend hours alone in the studio." Murray explains that while her recent work is mnemonic and intuitive, literary classics, namely Lord Of The Flies and The Brothers Grimm, have resonated with her since she first read them as a child, have had a direct influence upon her interests and the development of her ideas. Mythology, Man in its primitive state, the evolution of the human condition, conflicting impulses towards civilization and living by rules, mob mentality, and loss of innocence are subjects which have always fascinated her. Dystopia is particularly impactful because through juxtaposing prehistoric, symbolic, and mythological elements; good and evil; fantasy and reality, the artist has created drama, sparked questions rather than provided mere statements, and so opened up the potential for a dialogue with the viewer. 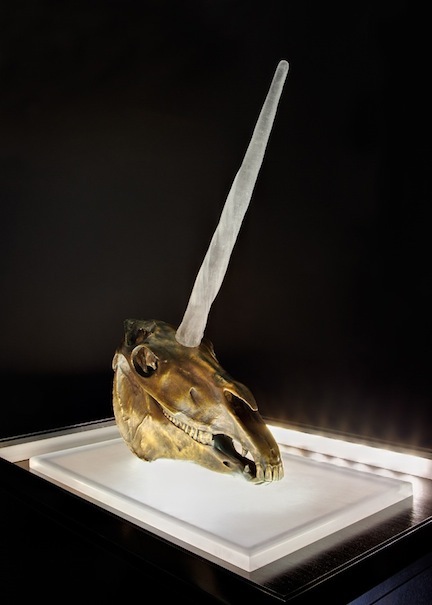 The installation and sculpture pieces, such as "Vicky" (a small pair of pristine white doll's shoes enclosed in an old iron birdcage) and "Unicorn" (a magnificent bronze horse skull and long glass horn placed upon a glass platform lit up by LEDs) not only bring an impressive coherence to the collection, they also infer a mythological tale, which creates a powerful narrative tension. The "narrative" could be equally be about a girl -- or Man's -- salvation as it could be about his or her suffering. In "Anna," does the unicorn skull that rests heavily on the young girl's head suggest oppression from dark and deathly forces? Has this virginal child had to prematurely confront [her own] Mortality? Or, like the children in The Lord of the Flies, has she cast off the shackles of civilization and become a savage, using the unicorn skull as some sort of symbol of tribal identity? As the viewer, you engage with Dystopia not just because you connect emotionally with the memories, the uncertainty, and the dreams and fantasies of childhood, but also because you are prompted to recognize that desperate and ceaseless search for truth, that existential anxiety that persists into our modern day adult lives. I begin to feel an enormous need to become savage and to create a new world. Tatyana Murray has exhibited her work internationally, with solo shows in Paris, London and New York, earning her widespread recognition in several publications such as the NY Times, The Evening Standard, Connaissance des Arts and Surface Magazine amongst others. She is currently working on three commissions and a new series, and has collectors in London, Paris and the Bahamas.